NASA instrument scientist Bryan Blair had just finished writing the flight software for the agency's Mars Orbiter Laser Altimeter, or MOLA, when he was invited in 1991 to fly a lidar instrument aboard a P-3 research aircraft to test new lidar techniques over the ice sheets in Greenland. En route, he gathered measurements of forested areas in New York state. What he discovered in the data stunned him, resulting in a 27-year quest to build a spaceborne lidar for measuring forests. That instrument—the Global Ecosystems Dynamics Investigation, or GEDI—is now collecting data as a payload attached to the Japanese Experiment Module, the largest science facility on the International Space Station. It is expected to collect data for at least two years. "We were shooting lasers over forests and what we saw were crazy, complicated results in the signals that came back possibly indicating the structure of the forests below," recalled Blair, the GEDI deputy principal investigator at NASA's Goddard Space Flight Center in Greenbelt, Maryland. The aircraft flight and discovery got him thinking: could light detection and ranging, or lidar—the technique that scientists used to map the barren Martian topography with MOLA—be equally effective at mapping forests? Using research-and-development funds he cobbled together from various NASA R&D programs, he advanced an innovative idea into the first-ever mission dedicated to providing three-dimensional views of forests and details about the role of forests in the carbon cycle. "GEDI's nearly three decades of development is a testament to the value of research and development, which often matures 'crazy ideas' into instruments. It also underscores the importance of conceiving an idea, building a prototype, testing the instrument, and, as in GEDI's case, building an aircraft instrument first to finalize the measurement technique and needed technologies," said Goddard Chief Technologist Peter Hughes. "GEDI is a poster child for what can happen when NASA invests in good ideas." Led by University of Maryland professor Ralph Dubayah, GEDI, pronounced Jedi, as in the Star Wars fame, carries out its job with several innovative technologies. Central to GEDI's capabilities is its trio of specialized lasers that send laser beams toward Earth where they penetrate forests and ricochet off everything they hit, which can be leaves atop a dense canopy, protruding branches, and, eventually, the ground from which the forest emerges. Its onboard telescope then receives the reflected signals tagging the time they take to return. However, GEDI, which NASA's Earth Venture program selected for development four years ago, does more. Unlike many other lidar instruments flown in space, GEDI employs the so-called waveform-based measurement technique that analyzes the shape of the returned light signal, not just the time it took to return. The waveform reveals the distribution of surfaces above the terrain, making it especially useful for measuring the density and structure of trees and vegetation, and even the structure of leaves and branches within a forest's canopy. Therefore, it allows scientists to obtain the three-dimensional structure of vegetation from space. This information is useful for mapping wildlife habitat, biodiversity, as well as the amount of biomass and carbon stored in vegetation. The 1,160-pound GEDI also sits on a gimbal, and therefore, is actively pointed to specific ground tracks on the Earth below. To give it an even wider view of the surface, GEDI uses sophisticated optics that divide the three laser beams into eight ground tracks—two of the lasers generate two ground tracks each, and the third generates four. Together, these technologies allow GEDI to sample all land between 51.6 degrees north latitude and 51.6 degrees south latitude covering temperate and tropical forests. "Without the pointing system, it would have taken three times as long to complete the coverage we need," Blair explained. Blair stresses that GEDI wouldn't have been possible without its predecessor, an aircraft-based instrument called Land, Vegetation and Ice Sensor, or LVIS, which Blair began flying in the late 1990s, just a few years after he conceived the instrument concept. 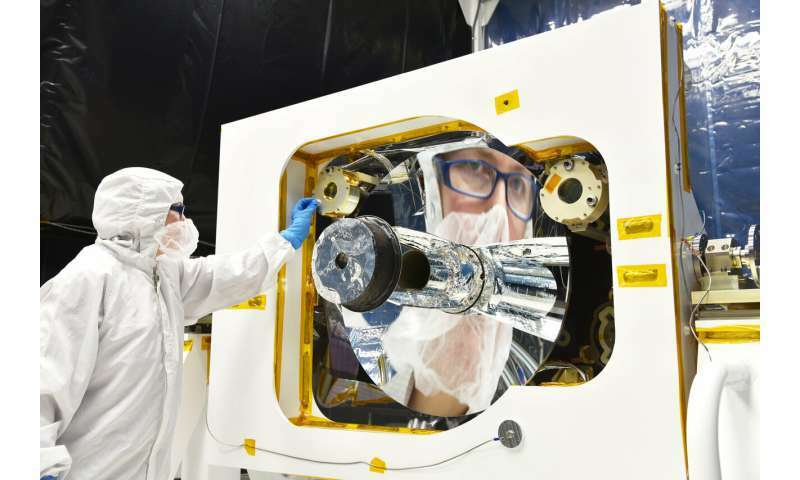 Since then, LVIS has become something of a mainstay for more localized measurements. In addition to mapping forests, LVIS has measured ice sheets. LVIS not only provided never-before-obtained data about forest canopies, it created a community of data users familiar with the measurement technique and its usefulness—a community that will make use of GEDI's more global measurements over the coming months, Blair said. "Without this already-established community of users, it would have been harder to get the mission funded," he said. "We pioneered this mission at Goddard," Blair added. "We couldn't have accomplished this without support from Goddard and NASA Headquarter's Earth Science Division over the years. This is a homegrown instrument based on a homegrown measurement technique."